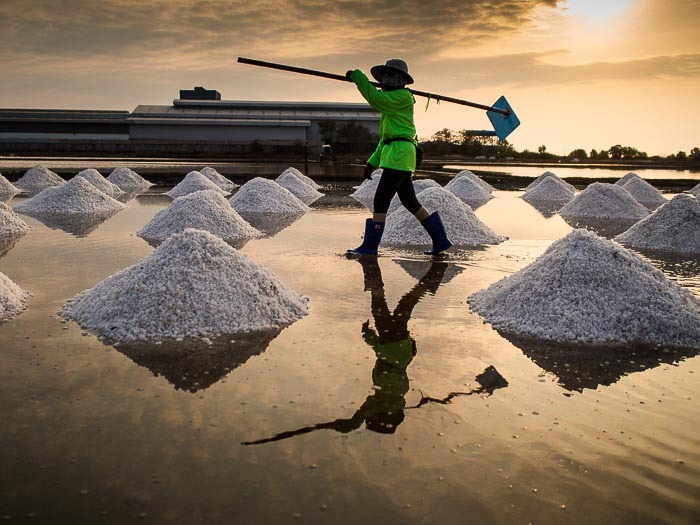 A worker leaves a salt field in Samut Sakhon province, south of Bangkok. 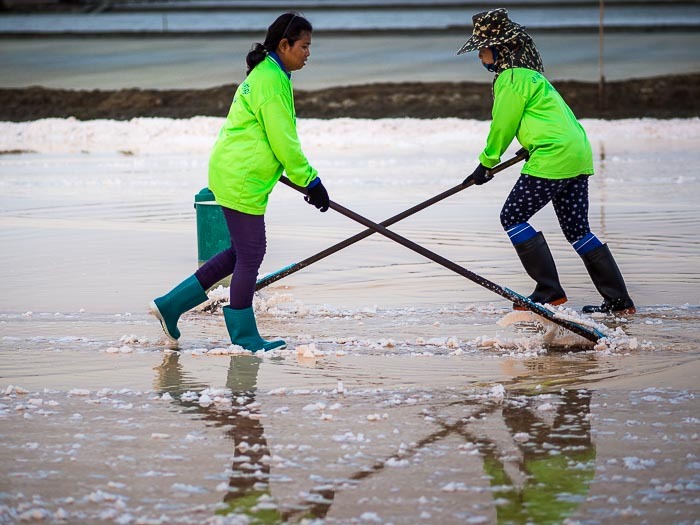 I went to the salt fields south of Bangkok this morning to photograph some of the workers. The fields are in Samut Sakhon and Samut Songkhram provinces, close to the Gulf of Siam. Fields near the Gulf are flooded with salty sea water. Mother nature takes over and the water is evaporated off the fields leaving a crusty covering of salt. They've been producing salt down here this way for centuries. Making the salt this way is a seasonal activity. They start collecting salt in February (the rains usually end in November and they need a couple of months to dry out the fields) and work in the salt fields until April or May, depending on the weather. The rainy season normally starts in June, but it starts raining in May, with storms becoming more and more frequent until the official start of the rainy season. In a typical year, they have about three months to collect salt. The last few years have not been typical though. Last year (2014) was a very good season for the salt collectors. Because the rainy season started late, they were able to harvest salt until mid-May. This resulted in a bumper harvest of salt. A worker catches his breath before pushing a wheelbarrow full of salt out of the fields. Because they collected a lot more salt than normal last year, some of the warehouses are still storing 2014 salt. The surplus of salt has depressed prices - one salt farmer told me 2015 prices are down about 15% compared to 2014 prices. And this year is setting up to be another bumper harvest since there hasn't been much rain this dry season (it normally rains a little bit all year round, even during the dry season, but this dry season has been very dry). The salt farmers are stuck. They can leave the salt uncollected in the fields but the land can't be used for other crops. The situation is not as desperate as the one facing rubber or rice farmers, and the number of salt producers is tiny compared to rubber and rice, but they are nervous about how the rest of the year is going to play out for them. Rain, or the lack of it, is challenging Thailand in new ways this year. For some, like the salt producers, the drought means an opportunity to harvest more of their products. But the extra supply is bringing down prices. Rice farmers are facing the loss of an entire crop. Some rice farmers in Thailand get as many as three crops out of their paddies but the government is warning them that this year there won't be enough water to irrigate the paddies during the dry season. The government is encouraging farmers to take employment off the farm during the dry season this year. 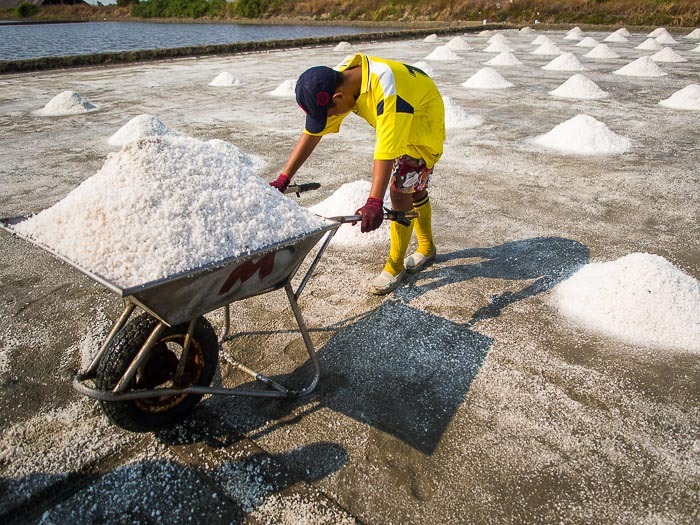 There are more photos of the salt harvest in my archive or available from ZUMA Press.